Contrary to its sombre title, this poignant play has a touching and romantic theme, following three friends who are coping with widowhood in different ways. An attractive widower tests the bonds of their friendship. 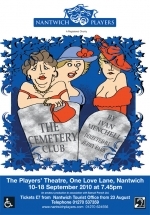 A bittersweet but very funny play with performances at 7.45pm 10 - 18 September.